Sports Girl (35) grabs for the ball from an opponent. 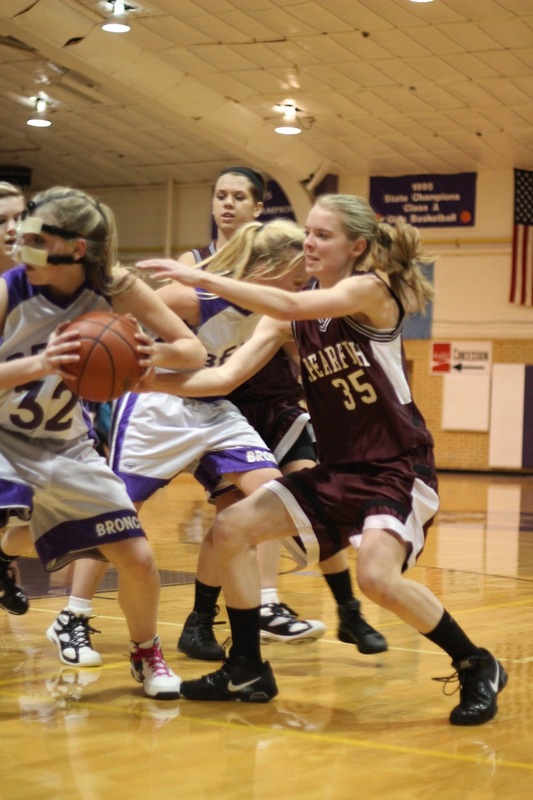 The poor girl holding the ball had broke her nose in a previous game. Playing sports can sure be dangerous! Sports Girl’s first high school basketball season has gone fairly well. She hasn’t set any freshman scoring records or anything, but she has been consistently able to play at up to the junior varsity level. And while the season hasn’t been completely without incident or injury, remarkably, nothing has involved her knee. And it’s not like she hasn’t taken more than one or two nasty spills onto her knee or knees on the hardwood or tile basketball courts across South Dakota. The surgery she endured over a year ago where a cadaver ligament was attached to her left femur and patella to replace her MPFL has so far proven successful in stabilizing her knee. She has had no further subluxation or dislocation issues, and she has had very little discomfort in her knee. She did, however, sprain her left ankle about a month ago, and she has had some pain from shin splints. The ankle sprain has continued to plague her, requiring constant taping during all practices and games to keep her ankle from rolling again, and continued icing afterwards. Now she has developed an allergic rash and a friction blister on her left heel from all of the taping. These injuries are really incidental. At least I think they are. I say that because I find it odd that all of her weaknesses appear to be on her left side. She had the most trouble with the Achilles tendon pain during soccer on her left leg. And now her left ankle has given out, as well. Sports Girl has been diligently strength training in the weight room, so I don’t think her left side can really be that much weaker than her right. Can it? Or could it all somehow be related to her knee surgery? Either way, I still declare the knee surgery a success. At least so far. Sports Girl is gradually regaining her confidence, and she doesn’t seem to worry about her knee any more. The reward is seeing that competitive spark return to her eye … and when she grits her teeth, watch out!